During the day sunlight falls on the SPV module, the cells on the panel convert solar energy into electrical energy. This electrical energy passes through the electronic circuitry to the battery, which gets charged, and stores the energy. This energy is then available for lighting the fluorescent lamp in the lantern at night. Emergency and/or house lighting, table lamp, camping, patrolling (streets, farms), Hawker / Vendor Stalls, non-electrified remote places: Adult education, mass communication, etc., Easy and convenient alternative to kerosene / petromax / gas lamps as well as substitute for domestic power connection. No Maintenance. No Accident. Very Low Weight.Brightness on Demand. 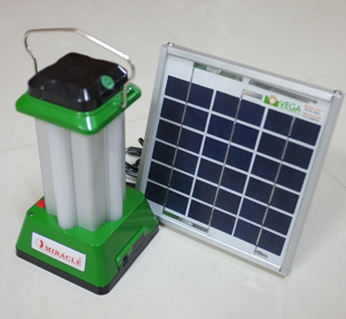 MIRACLE LED Lantern built especially for rural application. This has four sides LED lighting. These lights are designed to operate individually and can be switched on depending on the need. The back-up time of the light increases with less number of sides you switch on the lights. The LED light is very efficient and provides more life. Safety is in built by design and is easy to handle and operate. 8 hrs. Back-Up with one way Light. 4 hrs. Back-Up with two way Light. 3 hrs. Back-Up with three way Light. 2 hrs. Back-Up with four way Light. Solar Panel for solar charging. Back-Up 3.7V,2600mAH Lithium-ion Battery rechargeable.